OSWEGO – Veterans of Foreign Wars Post 5885 has adopted five Leighton Elementary School students by providing them weekend food for the entire school year through Blessings in a Backpack. Melissa Russell (center), coordinator of Oswego’s BiB program, accepted checks from the post and its auxiliary on Oct. 1. 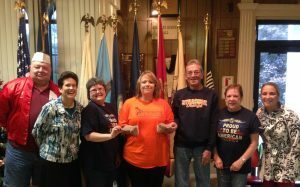 From left are post Quartermaster Alan L. Wood, Leighton Principal Kara Shore, auxiliary president Carol Sue Akers, Russell, post Commander Roy Cavalier, auxiliary member Jean Cavalier and Leighton counselor Andrea Orioli. Blessings in a Backpack provides weekend food for 300 needy children in the Oswego City School District. Church of the Resurrection, Oswego’s Episcopal church, is the lead sponsor of the Oswego program.